Hello, Clandestine fans! The band will return once again to the Texas Scottish Festival in Arlington on May 3-4. Will we have triple-digit temperatures? Will we have snow? This year, it’s a mystery! But there will definitely be good music on tap all weekend in Arlington. We hope to see you there! You know where we’ll be – at McGonigel’s Mucky Duck, where the music is real and the beer is NOT green! Get your tickets for Monday, March 17! We hope you will join us in celebrating the post-celebration season! Clandestine will be performing in Houston on Friday, January 10, at the Mucky Duck. We have the early show, and fellow Houston favorites the Flying Fish Sailors will be playing a separate show at 9:30 pm. Thank you for supporting live music, Celtic music! Clandestine will be performing in Houston on Thursday, September 19, at the Mucky Duck. We would love to see you all out there to support Celtic music in Texas. 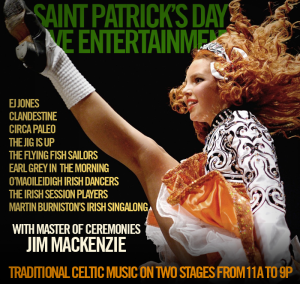 And then you can find us all weekend at the 3rd Annual Sherwood Celtic Music Festival! Come get a taste of fine high energy Celtic music with great tunes and excellent songs! Clandestine has two performances in Houston the second weekend in July. The first is on Saturday, July 13 at Jones Hall in downtown Houston. The Houston Symphony is hosting Day of Music – A Free All-Day Event. There will be performances by musical groups of every description all day! Clandestine will be performing free in the front lobby at 11 am. Come out to support the local music scene and enjoy the food trucks next door! On Sunday, July 14, the band will be performing a rare acoustic house concert at the O’Leary-Appling home. These are the fine folks that run the Sherwood Forest Faire. You can find out more information on their Facebook Event page. And never fear, Clandestine will be back at the Mucky Duck on September 19!